This page was created on February 24th, 2012, as a location for some information of historical interest, and may be updated from time to time. The first two items relate to efforts to enact a statewide Clean Indoor Air law, both of which Missouri GASP opposed for different reasons. 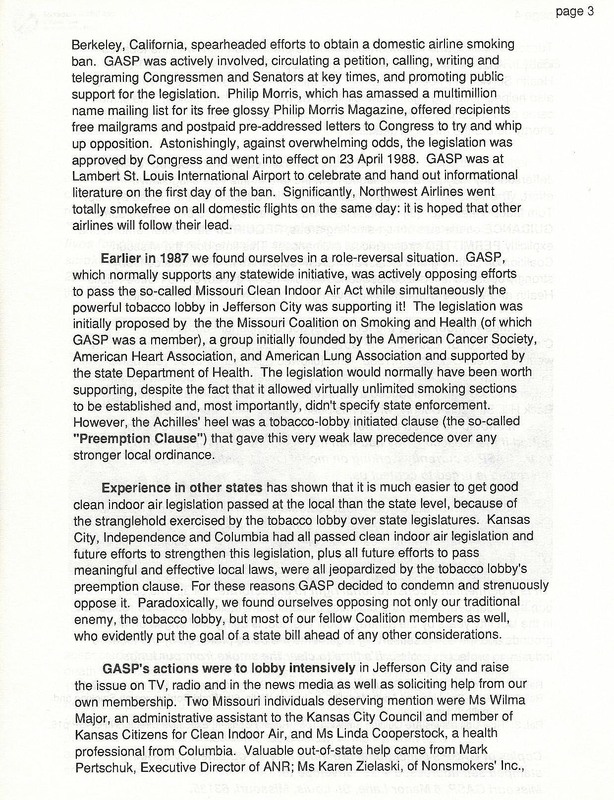 We opposed the first, in 1987, because a very weak bill contained a preemption clause sought by the tobacco lobby which would have meant that, if passed, it would have prohibited any stronger local ordinances from being enacted. 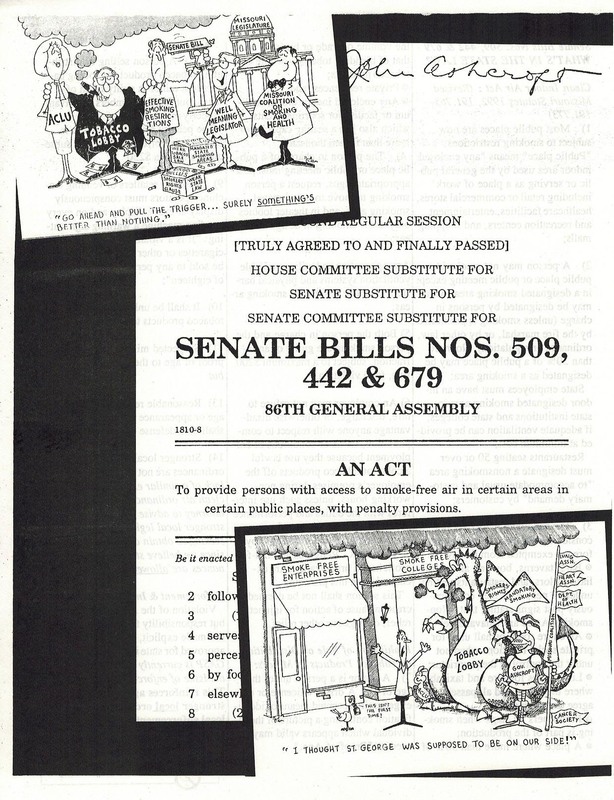 The second, the Missouri Clean Indoor Air Act of 1992 (Senate Bills Nos. 509 et al), was a slightly stronger bill with no preemption clause but it contained two unacceptable tobacco lobby amendments, one requiring smoking rooms in smoke-free Missouri state government offices, the second elevating smoking to a civil right. The first page featured a photo of former U.S. 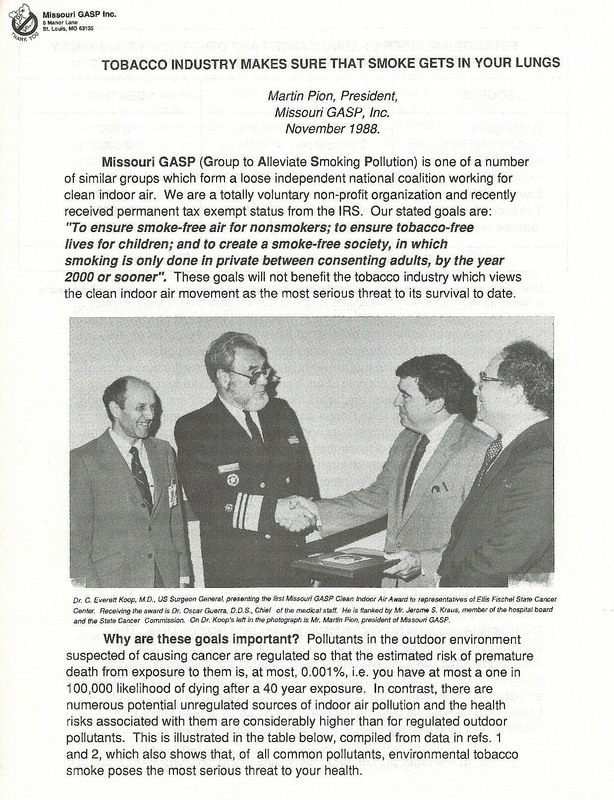 Surgeon General, C. Everett Koop, MD, presenting the Missouri GASP Clean Indoor Air Award in St Louis to representatives of the Ellis Fischel State Cancer Center for making its campus entirely nicotine free, followed by details of Dr. Koop’s visit to St. Louis to address a workplace smoking conference. 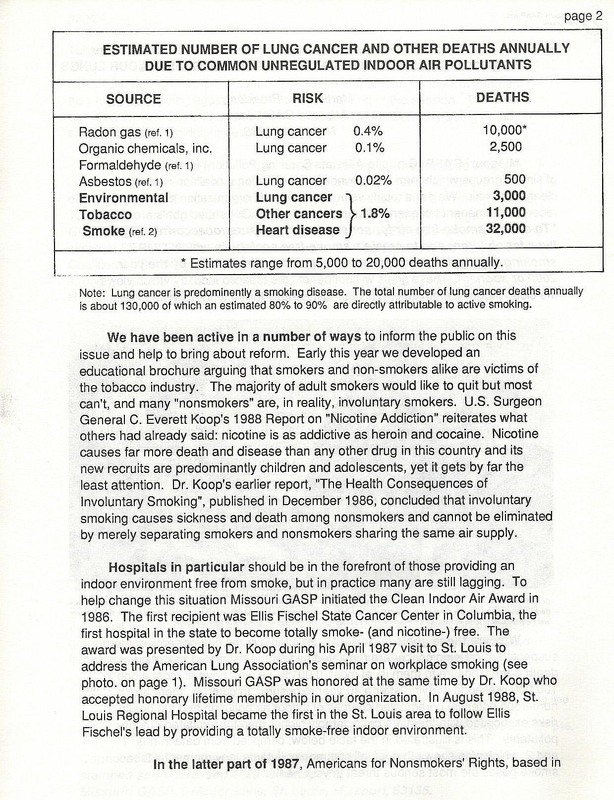 On pages 3 and 4 was a description of MoGASP’s successful efforts, in concert with others, to defeat an attempt by the voluntary health agencies, American Lung Association, American Heart Association, and American Lung Association, together with Susan Sherman, lobbyist for the Missouri Department of Health, to pass a weak statewide Clean Indoor Air Act which, in order to gain the support of the tobacco lobby, contained a preemption clause preventing any stronger local ordinances from being enacted. The fight against the bill was a nail biter, with it only being defeated in the House chamber on the last day of the session. This contained unacceptable language inserted by the tobacco lobby requiring smoking rooms in state office buildings, and elevating smoking to a protected civil right. The lobbyist for then Governor John Ashcroft, Phil Irons, worked to neutralize the tobacco lobby language by amending it. The first section requiring installation of smoking rooms in state institutions and state colleges was made conditional on “adequate ventilation being provided at minimum cost.” In the second section seeking to elevate smoking to a protected civil right in the case of employment, Irons added wording designed to nullify any damages. 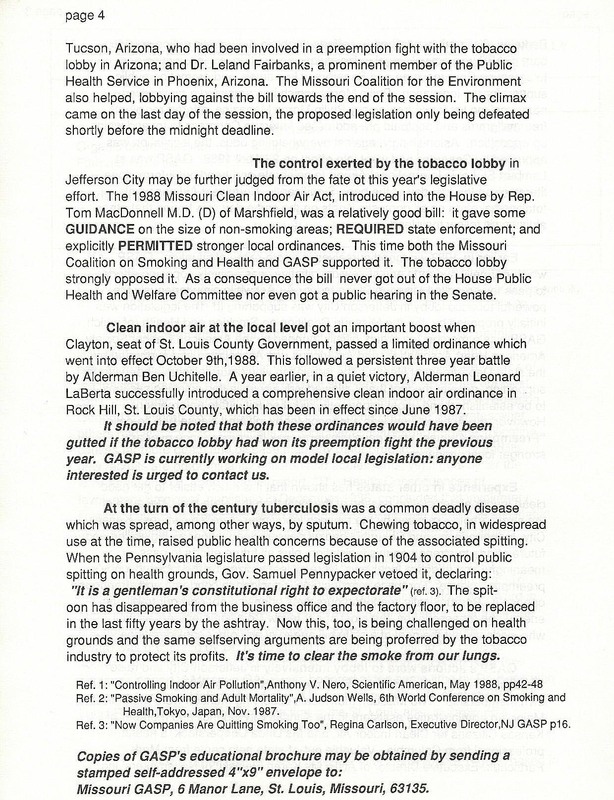 The lobbyist for the ACLU, which wanted to prevent employment discrimination against both smokers and drinkers, was allied with the tobacco lobby, and the Missouri Coalition on Smoking and Health, led by the American Heart Association, American Lung Association, and American Cancer Society, also supported the measure. 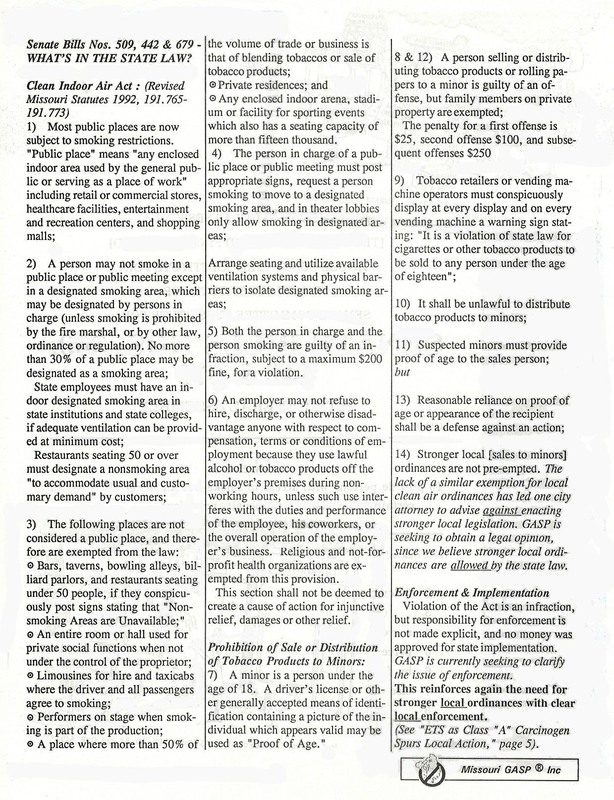 The 1992 bill was signed into law by Governor John Ashcroft, as indicated in the facsimile below, and despite the change to the section regarding employment of smokers, some employers subsequently interpreted this wording to mean that they could not limit their hiring to non-smoking employees.